Have you ever tried to make a pinwheel? Some of us got a bit muddled on the first go. I did anyway. Well here is some simple instructions that will help you get it write first time. It`s real easy, enough to class it as one of my easy paper crafts. 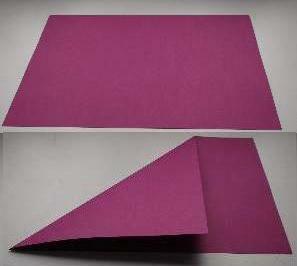 You can use plain thin card or paper, white or colored. Don`t use card that is too stiff. Get some sticky backed shapes to decorate it, like stars or flowers. 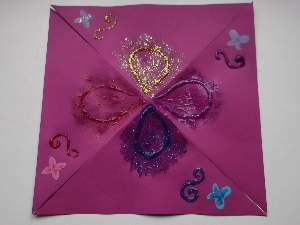 You can make bold patterns using felt tip pens or make a dazzling pinwheel with glitter. Cut out a square about 20 cm each side. It doesn`t need to be this measurement. 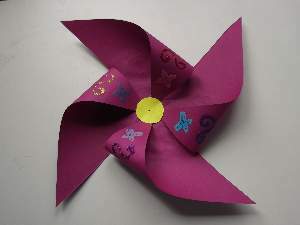 As long as all the sides are equal lengths, you can make a pinwheel larger or smaller. Once you cut out the square, draw a faint line from one corner to the opposite side. Repeat it by drawing a second line joining up the other corners. This should form an X if you have done it right. Measure 1/3 along each line from the center and put a dot. Then cut each line from the corner to the dot. (Not the center) You should now have 2 blades at each corner of your square. When you have completed cutting all the lines, you can decorate both sides. I used glitter glue on mine. Now take the end of the blade that is to the right on one of the corners and stick it at the center. 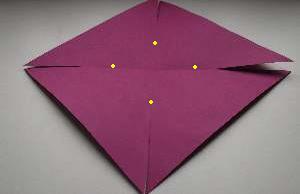 Do this to the other 3 blades that are to the right to make the pinwheel sails. I used a contact adhesive dot which is very effective without making the center wet. See! It`s looking like a real nice windmill already. To help stop it from tearing, cut out 2 circles about 2 1/2 cm diameter and stick them at the center on the front and back. If you used wet glue, wait until it dries then make a hole in the center. Widen it with a skewer or something not too thick. 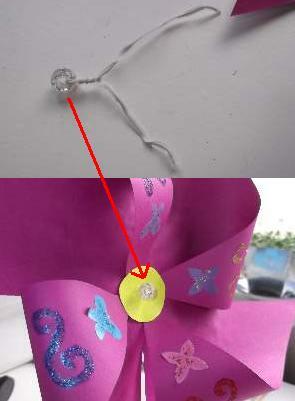 To make a pinwheel shaft, use a bead and wire tie. You can get wire ties from freezer bags or sandwich bags. Thread the bead to the middle of the wire and twist it a few turns. Now thread both wire ends through the hole. Thread another bead onto the wire shaft and twist both wires together for a few turns. Take your dowel and wind the shaft round the dowel, winding downwards underneath the first wind and not above it. See my picture. This will stop it from hitting the dowel when the wind catches the sails. 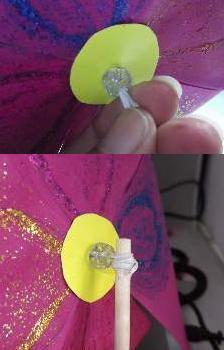 The other alternative is to take a 1" pin or tack and tap it through the pinwheel into the wooden dowel. I prefer my method for younger children. You can tie and glue some ribbons on the end of your dowel. Your pinwheel is ready to spin! But you know you don`t need to wait for the wind. You can create some! Just raise it in front of you, facing forward and walk. Amazing! 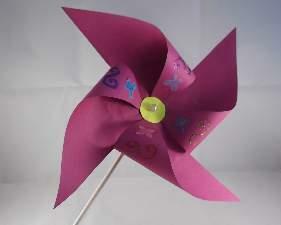 Enjoy your pinwheel, or as they say in the UK, your "windmill".